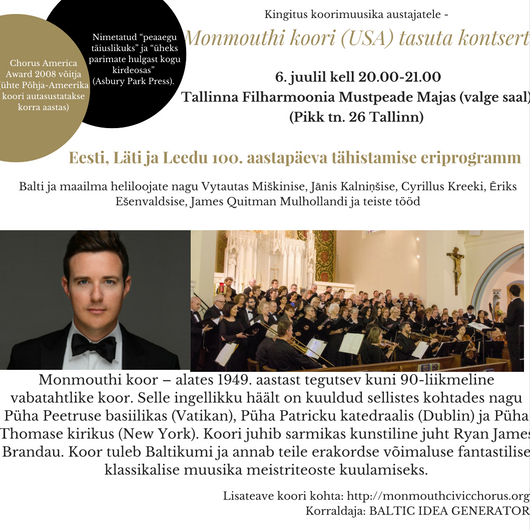 Visiting the Baltics for the first time, the Monmouth Civic Chorus (US), brings special program dedicated to the Centenary of the Restoration of Lithuania‘s, Latvia‘s, Estonia‘s Independence. You will have exceptional opportunity to hear fantastic masterpieces of choral music, writen by Baltic and World composers. Monmouth choir - a volunteer community choire ( Monmouth County, New Jersey, US), uniting more than 90 members. In addition to singing locally, it has brought the finest in choral music to audiences around the world since 1949. Angelic voices of the choire were heard in such places as St. Peter’s Basilica (Vatican), St. Patrick's Cathedral (Dublin), St. Thomas church ( New York). Monmouth choir has been called “close to perfect” and “among the very best in the entire Northeast” (Asbury Park Press). It is proud to be the 2008 winner of the Chorus America/ASCAP Alice Parker Award, given to only one chorus in North America each year. Accompanist - Patti Carlisle D’Andrea has been a singing member of MCC since 1987 and joined three previous European tours. Participant of countless performances and festival, as organist, music director, accompanist, keyboardist, Patti currently is a President of the MCC Board of Trustees. The programme will consist of the pieces of the following composers: Vytautas Miškinis, Jānis Kalniņš, Cyrillus Kreek, Ēriks Ešenvalds, James Quitman Mulholland, Hugo Alfvén, Healy Willan, Richard Ayres, Dolly Parton/Johnson, Nigel Short/Mack Wilberg, Rollo Dilworth.